A Bangor University student from Peterborough is on course to achieve her dream of becoming an accountant having secured a place on a prestigious training scheme in London. Jessica Casey, a former pupil of The King’s School, has been offered a four-year graduate training contract with London-based accountancy firm Chantrey Vellacott DFK, which will see her become a fully-qualified chartered accountant. To top off her achievement, she will graduate from Bangor University this week with a First Class degree in Accounting and Finance. The 22-year-old is now looking forward to the experiences that her new career is set to bring. “The four year contract will take me through the professional accountancy exams whilst gaining the required number of work experience hours in auditing. After three years I'll be a fully-qualified chartered accountant and auditing full-time. 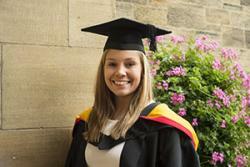 Three exciting years at Bangor have taught Jessica that university is about more than just academia. “I used to think that university was just about getting a degree, but it's not”, she observes. “Bangor has taught me that it's also about the experiences, the people you meet along the way, and how to grow into a better person.